Correct errors in your notes with a click of the mouse. The software works like any audio editor and is intuitive to use. Simply select a note by highlighting it with the left mouse button, then click on the highlighted area with the right mouse button. If the note can be identified, it will show the current note value on The Even Tempered Scale. At the same time a tuning menu will appear that permits you to change it to some other specific note value or adjust it up or down some number of semitones. See the example in the screen shot above. The vocalist intended a natural B but it came out a bit sharp. 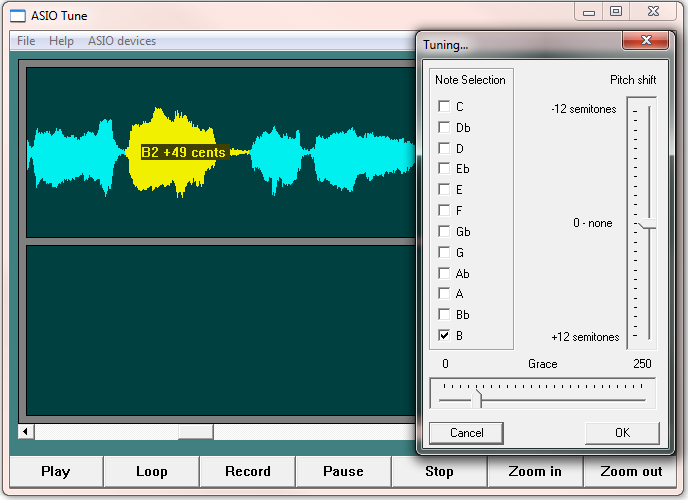 B is selected in the tuning dialog, poised to correct it. Click OK on the dialog, and the sharpness is gone. Select a wider swath of the musical phrase and loop through it while listening to your edit. If satisfied, move on to examine some other part of the track, or save it out to disk. Experiment and tweak at will. You can always undo your last edit - even while listening to the change - by pressing 'U' on your keyboard (not case sensitive) or selecting "Undo Tuning" from the File menu. Before you begin, set your ASIO sample rate to 44100, and I would suggest a buffer size of 256. Now select your device and load in wav or mp3 files or record up to one hour. If your source material is not at that sample rate, it will automatically be resampled to 44100 samples per second, but it must be 16 bit mono or stereo. Recording is in stereo. While playing you can zoom in and out or resize, but when in record mode everything is fixed for the duration of the recording. Even if you don't have ASIO, you can still load in a file and examine it, or even tune it, but of course you won't be able to hear what you are doing until you save it out and load it into your audio player. If you don't have an ASIO driven sound card, try installing the ASIO4All driver to adapt your existing sound card. To verify this software functions as advertised experiment with these MIDI guitar notes . Try this file of a tune composed of pure sine waves and you will see that every note can be identified within a cent or two, but don't expect note identification in natural material to be accurate down to the last cent. In any event, trust your ears first, of course. As you must know, the Even Tempered Scale is only an artificially imposed compromise in a world where artists will naturally tend toward real harmonic relationships that often fall off the Even Tempered Scale. If you are having difficulty reading a note that you think should be determinable, try selecting only different parts of that note - at least to read it. For best results, select at the zero crossings. Only pure notes can be identified, whether voice, guitar, piano, etc. If there is roughness, noise, accompaniment or a rhythm track in the background, there is no way to identify the note value. However, you should still be able to at least change the pitch. After selecting an area, you can click on the ends of the scroll bar to adjust your selection or use the left and right cursor keys (assuming the scroll bar has the focus). By the way: There is a minimum size to what you can select. If you try to select a smaller segment, the highlight will expand to fill the minimum requirement. This should not be a concern. After all, we are selecting musical notes here, and notes are composed of some significant number of samples normally well beyond the minimum currently set. Recordings are automatically made in stereo. If the output of your microphone runs to both channels, then you will have the same audio in the left and right channels. This gives you the opportunity to tune notes differently on the right than on the left to create harmonies. Finally, you can select a number of notes in a row, put the expected note values in the tuning dialog, and correct them all at the same time. You may hear one note "glide" up or down to the next, over the glide duration you set in the tuning dialog - at times giving a bit of the "Cher" effect. You can experiment with singing deliberately off key and tuning this way to produce such vocal effects as made famous in Cher's song "Do You Believe". You can zoom all the way down to one sample per pixel. When playing zoomed in such that the audio display is whizzing by very quickly, no attempt is made to display the play cursor, as in such situations it wouldn't be really usefull anyhow. If you are looping and listening to an edit and decide to hit the undo while it is playing, of course you will definitely hear it revert, but at times the display may not refresh and show your change if your highlighted portion is entirely within view. Just click zoom and the display will refresh. Pitch shifting: Although you are given the option of plus or minus 12 semitones, probably 6 either way is the most you would find gives satisfactory results. With your help, this software may evolve. Feel free to email me with your comments, questions, or suggestions. Really - I would appreciate your feedback!